new dreams, hopes, aspirations and resolutions! we would be astonished by the number"! (we would probably be blown away!!!). was spread over four whole pages! thanks to our kind-hearted Pat! by organizing a party to help grow your blog. the rest of the blog world. 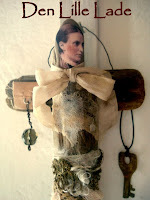 have created for my dear friend Andrea. Pearl is on the right of this image! for her Birthday in December. and the continued gift of good judgement! Labels: Grow Your Blog, New Year, Vintage Fabric Collage. 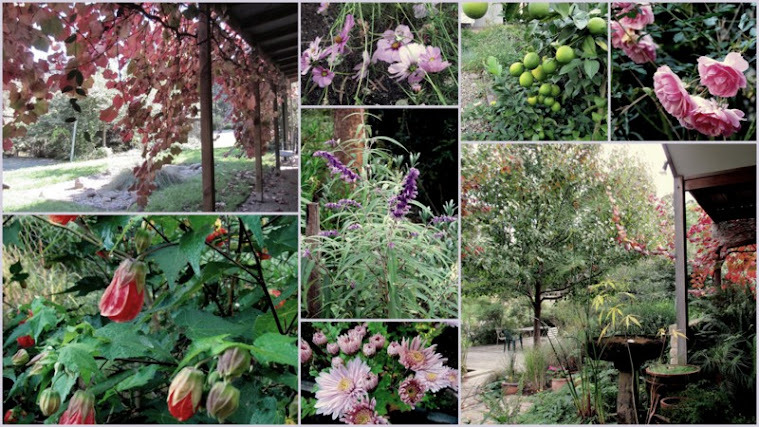 Congratulations for your pictures in Pat Winter magazine! I run to buy it! HAPPY NEW YEAR SUZI !!! I love the picture of Grandma Pearl and her sister! What a great spread in Pat's Magazine.I will have to get this one- especially as you are featured.Pat's layouts are great aren't they? Hope next year is even more successful for you. Love the picture. Happy New Year! Already a creative dream has been fulfilled for you, how absolutely amazing Suzy, the article looks exquisite. I feel so lucky to have found you and to know that I have your art in my home and the joy that brings with it. Here's to 2013 being a year brimming with brightness, you deserve it dear Suzy. Happy New Year Suzy! Congratulations on your magazine spread and thanks so much for making our world more beautiful...and for the link! Congrats on your awesome feature!! Such a wonderful way to end 2012. I hope you have a marvelous 2013 and I look forward to seeing more and more of your gorgeous work! Happy New Year Suzy and more successful fo you.!! Grandma Pearl was a beautiful lady for sure . Your work just made her more lovely. Happy New Year to you Suzy. May 2013 be the year of joyfulness. Wishing you a healthy and Happy New year to you Susie! 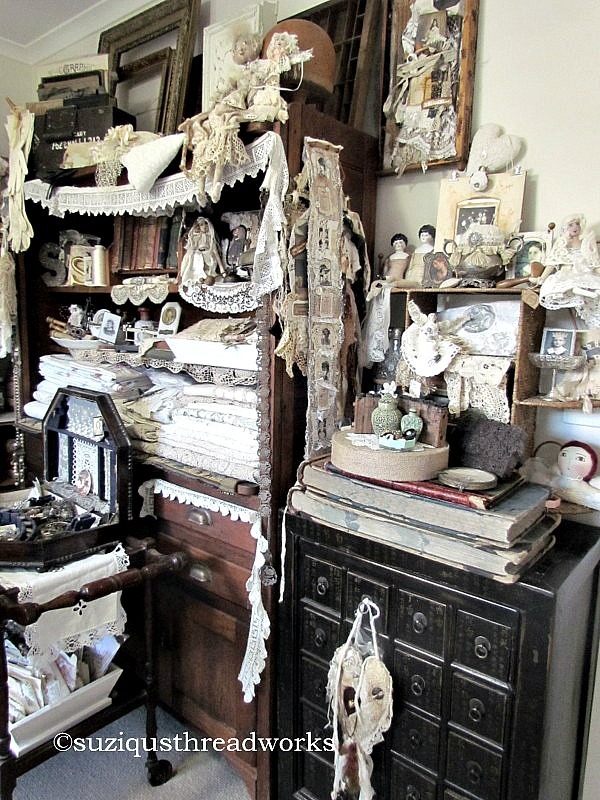 I am always amazed at your incredible talent, and the way you use your vintage pieces...I so love vintage! You inspire me so much! 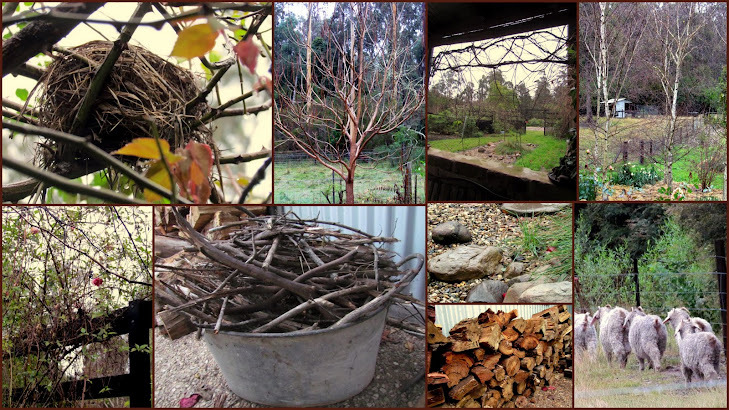 I hope to be a better blogger in 2013, so i am off to check out Vicki's blog. Your collage is so beautiful! Hugs to you for the New Year! I hope that 2013 brings you SOOOOOO much creative fun Suzy! ...and it's great to have so many lovely people to share it with. Happy New Year Suzy, have a great 2013. Congratulations on the publishing of your art-beautiful. Grandma Pearl art much have been a gorgeous surprise. 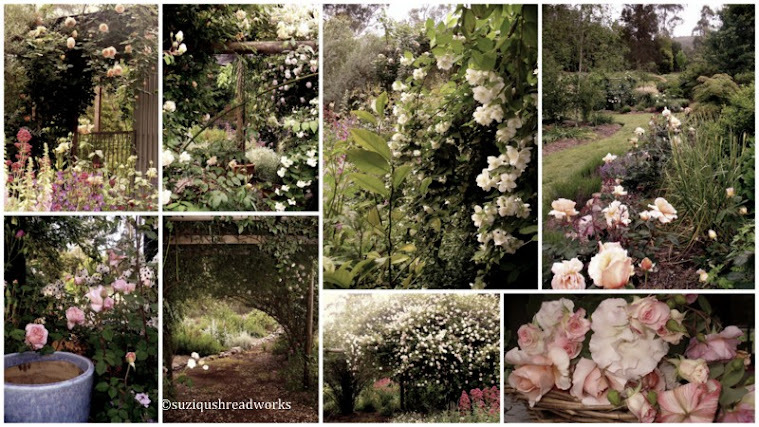 I enjoy blogs and continue to learn from those you are generous enough to share-thanks Suzi. Wiahing you much success and hours of creating enjoyment. Happy New Year. I drooled all over your article in the magazine. Pat does a marvelous thing for us, for sure. I think I'm going to sign on for the grow-your-blog - it sounds like a lot of fun. Happy 2013 to you and yours! Congratulations on the magazine publishing. No better person/artist to have it happen to. Happy New Year! Another stunning piece dear Suzy! You are amazingly talented, so I was not surprised you were published in Pat's magazine, congrats. I hope 2013 brings you everything you hope and dream for. I enjoyed your article in Pat's magazine, Suzy. It showcased your beautiful work so well. 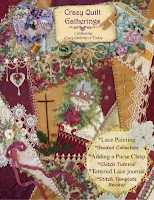 Wishing you a New Year filled with more opportunities and layers of luscious lace! Girl, such a fabulous and heartwarming post! 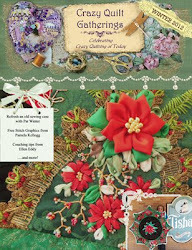 I love the layout of your creativity in a magazine! :) Wishing you and your loved ones a very Happy New Year my dear! Happy New Year Suzy, and congratulations on being published yet again. The magazine looks like it could be a work of art in itself. My grandmother's name was Pearl also. I need to make some kind of tribute to her also. Wonderful idea. I forgot to tell you congratulations on the gorgeous feature in the magazine! So beautiful Suzy! Happy New Year, Suzy, my dear friend, luvya, girl! 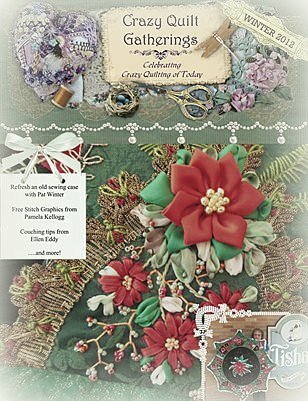 CONGRATULATIONS, on being featured in Pat`s beautiful magazine,it looks as fantastic 4 pages, with your amazing art ,dear friend. You being here in blogland is a very special thing for me,- as if not-! I would never have known there is a Suzy somewhere out there! Now I happily know! Andrea must have been amazingly thrilled for that stunning collage with her grandmother...it is more beautiful, than words can descripe! I hope your number 2 day in the new year brings you much happiness,and beauty, as you bring us here, sweetie. Congrats on the publication. I need to order that magazine, it looks beautiful. I will also pay a visit to Vicki, she is an angel. Happy Healthy 2013 to you and yours! Dear Suzy, congratulations for your publication in Pat Winter magazine and thank you for all the inspiration you give to me! Suzy - I love your beautiful heart and all the gorgeous projects. Congrats on the publication too! Looking forward to seeing more of your gorgeous art in 2013. I am so beyond thrilled for you!!!! 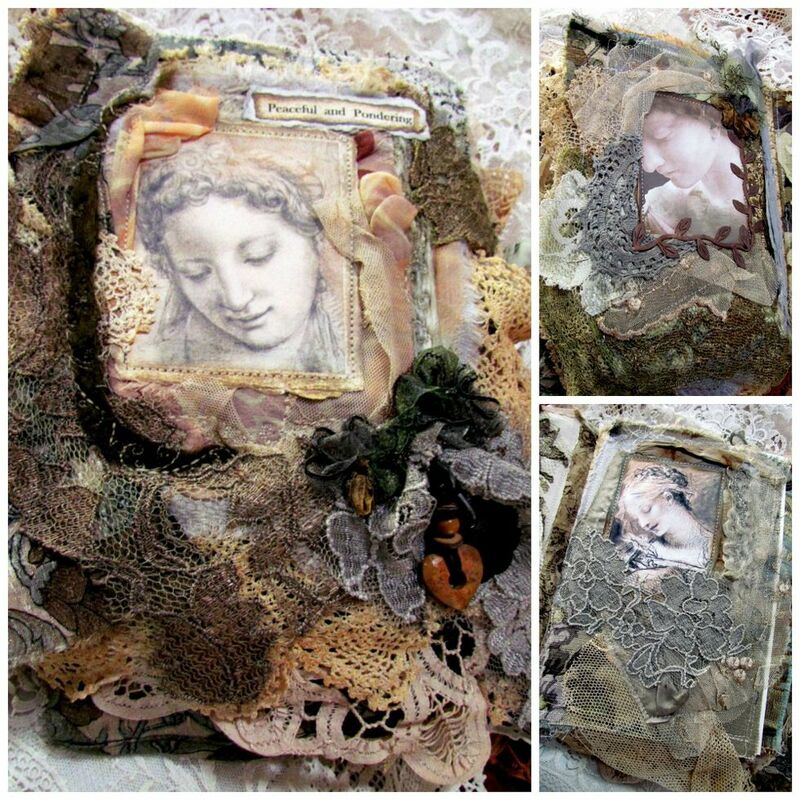 Your creative talents for combining different textural elements deserves to be showcased on a four page spread! I love your style! Thanks for sharing all that you do and wishing you the best in 2013! Congratulations on your wonderful accomplishment; well done! See you at Vicki's; it's going to be a blast! Happy New Year too and may all your dreams for 2013 be fulfilled!! 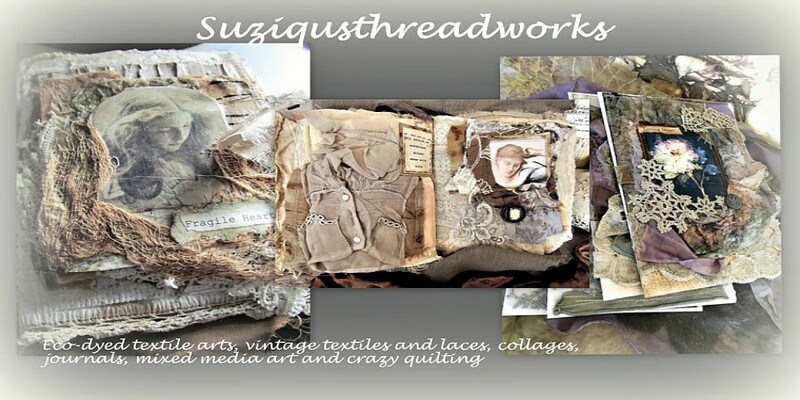 Thank you for a year of sharing your inspiring creations on Suziqus Threadworks. Every visit here is a magical experience that stimulates my creative juices - I'm sure this goes for all your followers dear Suzy - MERCI! 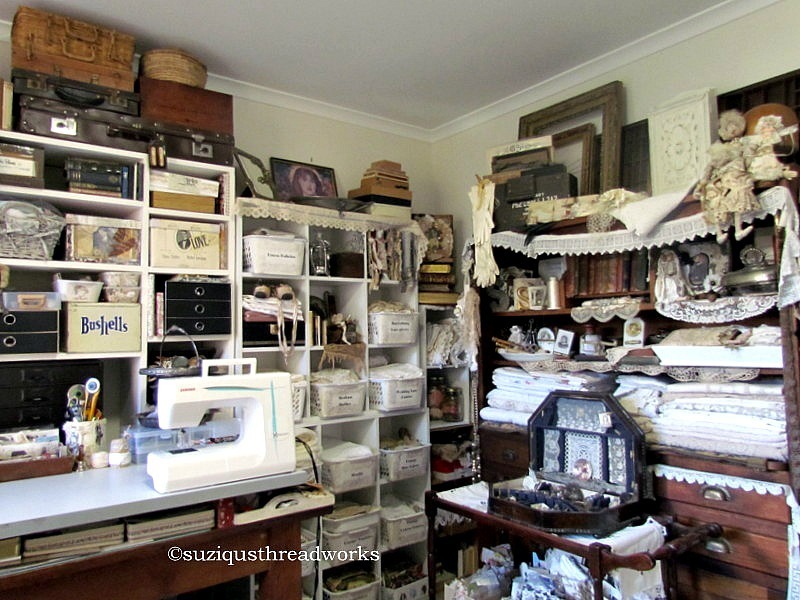 I'm so happy you have been published and your exquisite textile collages can be appreciated by a wider audience - beautiful works of art like yours Suzy are for everyone to enjoy! With the 'Grandma Pearl and her Sister' image from Andrea you've created a birthday gift she will treasure forever. These links to our past are so precious and your collage will be loved and admired by generations to come. 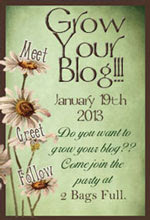 I've now joined Vicki's "Grow your Blog" party thanks to your encouraging words! It's great to spread the message of linking 'like minded' bloggers world wide - if it wasn't for blogging you and I would not have met and now we've become soul mates - I treasure that! Here's to creating with passion and opening our eyes, heart, mind and spirit on our journey through 2013! 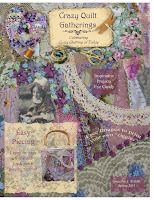 Pat's amgazines are such a treat and your book looks fabulous spread across the pages of her latest issue!! Pat is a dear and I do so love working with her!! Your Collage for your friend si glorious and I am sure that she creid when you presented it to ehr!! youare such a wonderful and genrous heart!! Now I am off to find out about growing my blog!!! happy new Year Dear ! Art On!! Your magazine spread is beyond beautiful-/ your attentions are so well deserved- I'm just so very happy for you!! Can we all have your autograph?? Wait-- I have it! !